At B-Dirt Construction, we give you more. 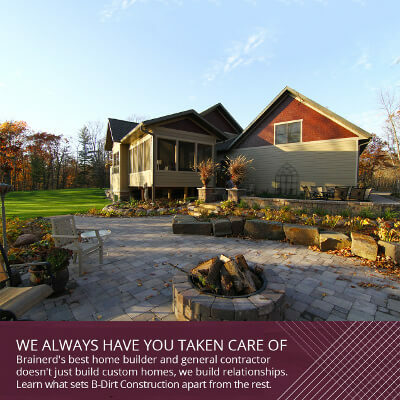 Brainerd's best home builder and general contractor doesn't just build custom homes, we build relationships. B-Dirt construction has a strong family dynamic, and when you build with us, you become part of our extended family. 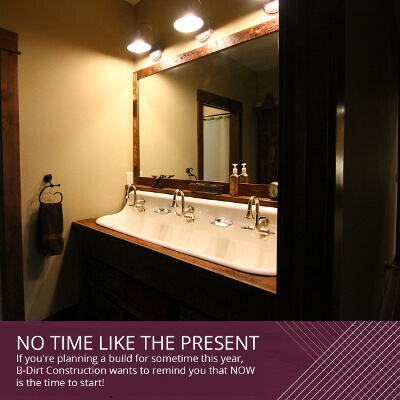 Everyone on our team is involved in the process, and we work together to build your dream home. Everyone is an important part of the building process, so our customers get to know all our team members and work directly with them. 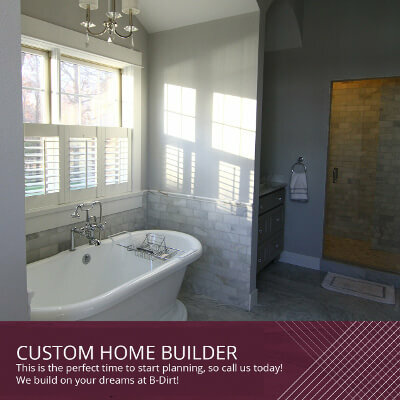 Building a home can be a daunting process, but B-Dirt Construction is with you every step of the way to make the whole project enjoyable for everyone. You will work directly with our project coordinator, who will guide you through the building and decision-making process. With the best contractors, customer service, and one-on-one relationships, you'll soon learn what sets B-Dirt Construction apart from the rest. Call today for your free consultation: (218) 821-5243. We look forward to welcoming you to the family! 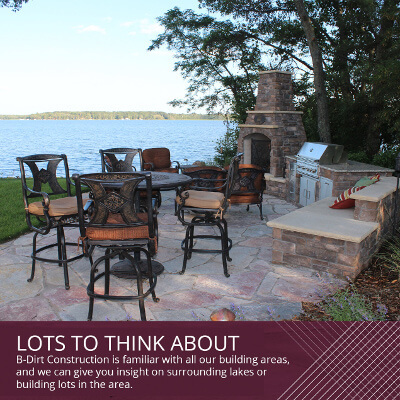 B-Dirt Construction is more than just a Brainerd residential construction company and custom home builder. We are a local company that you can trust. When you build with B-Dirt Construction, you become part of the family. 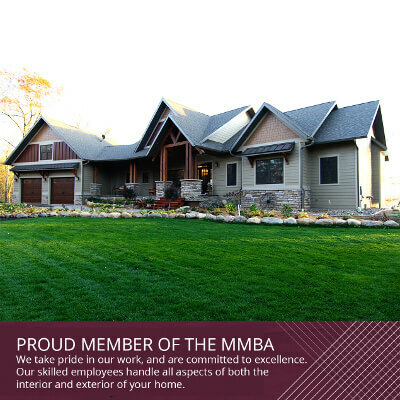 B-Dirt Construction is a proud member of the MMBA (Mid-Minnesota Builders Association). We take pride in our work and are committed to excellence. 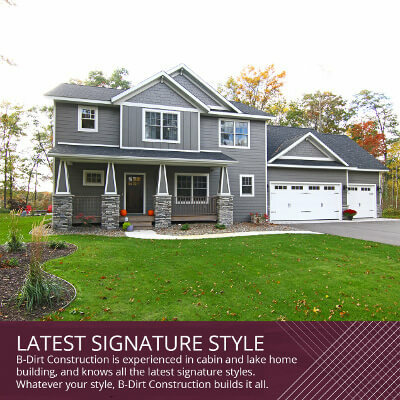 B-Dirt Construction has also been the proud recipient of the coveted Best of Show awards from the MMBA during many Lakes Area Home Tours, as well as the Builder Member of the Year Award and Lake Friendly Construction Award. At B-Dirt Construction, we simply are the best at what we do. Our skilled employees handle all aspects of both the interior and exterior of your home. We even have our own cement crew! Don't trust your dream home to just anyone. Call B-Dirt Construction and be assured you're in the best possible hands. Your free consultation awaits (218) 821-5243. 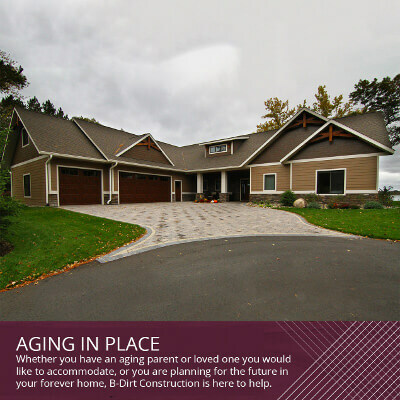 Whether you have an aging parent or loved one you would like to accommodate, or you are planning for the future in your forever home, B-Dirt Construction, Brainerd custom home builder, is here to help. 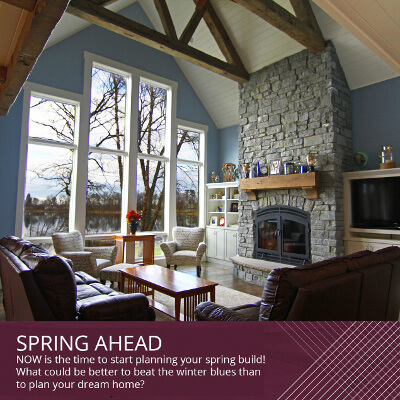 Perhaps you are building a retirement home, or converting your lake home into a place to retire. What considerations should you include? B-Dirt Construction uses the latest CAD 3D software to help you visualize what your new home features will look like. You may want to consider a single-story dwelling or the first-floor laundry for easier use. Zero entry showers are also important to consider. You may want to keep stairs to a minimum. 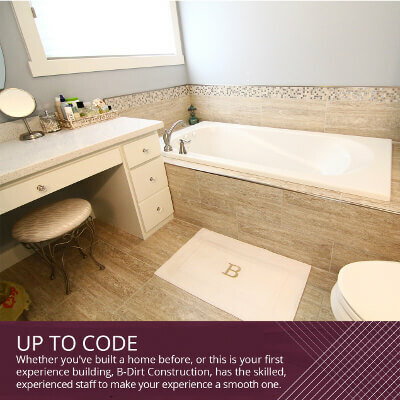 Whatever your ideas or needs, B-Dirt Construction does it all. Trust B-Dirt to build your home with a vision for the future. When you build with B-Dirt Construction, you become part of the family. Call today for your free consultation: (218) 821-5243. We look forward to meeting you! 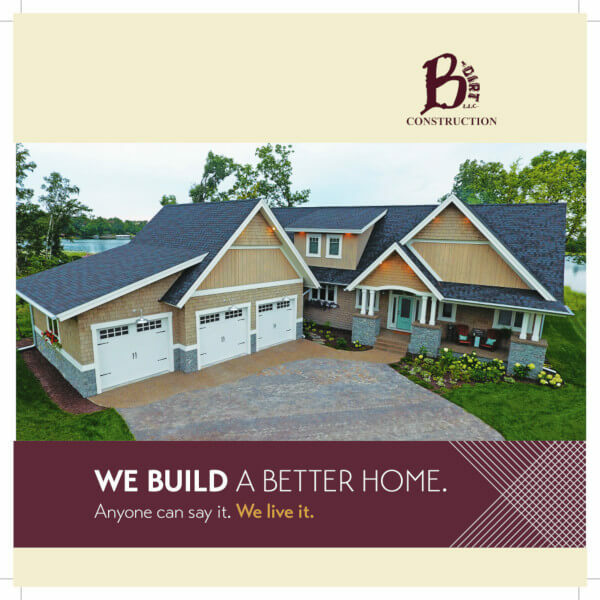 B-Dirt Construction, Brainerd custom home builder, builds many homes, lake homes, and cabins in Brainerd, Bass Lake, Gilbert Lake, Crosslake and surrounding areas. Our clients often wonder about sound batt insulation, and if it is worth the investment. B-Dirt Construction does offer this option for those that are interested. Typically sound batt insulation is recommended for ceilings in multiple level homes, and helps by muffling noises between levels. 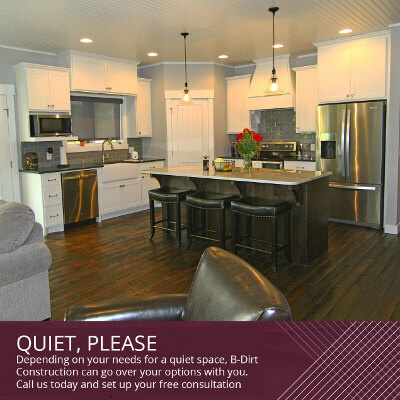 Depending on your needs for a quiet space, B-Dirt Construction can go over your options with you. Call us today and set up your free consultation: (218) 821-5243. We look forward to meeting with you!